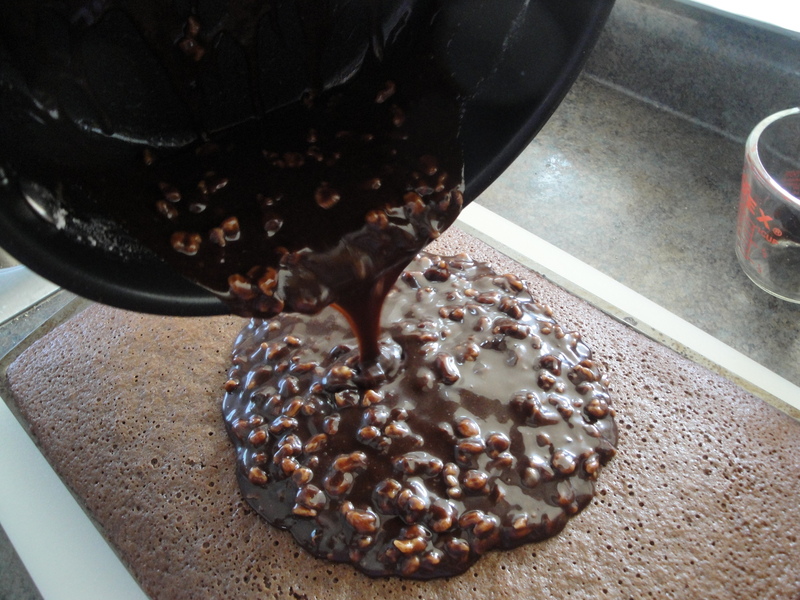 Some of you may have never heard of Texas Sheet Cake but it’s a thin, rich chocolate cake that I remember my mom making frequently when I was little. 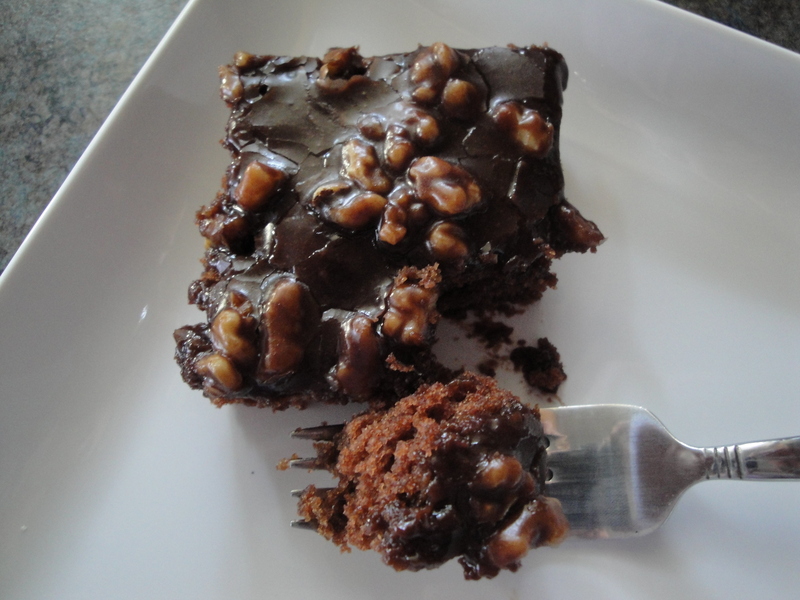 The cake itself isn’t uber-chocolatey like a death-by-chocolate cake but it doesn’t need to be. 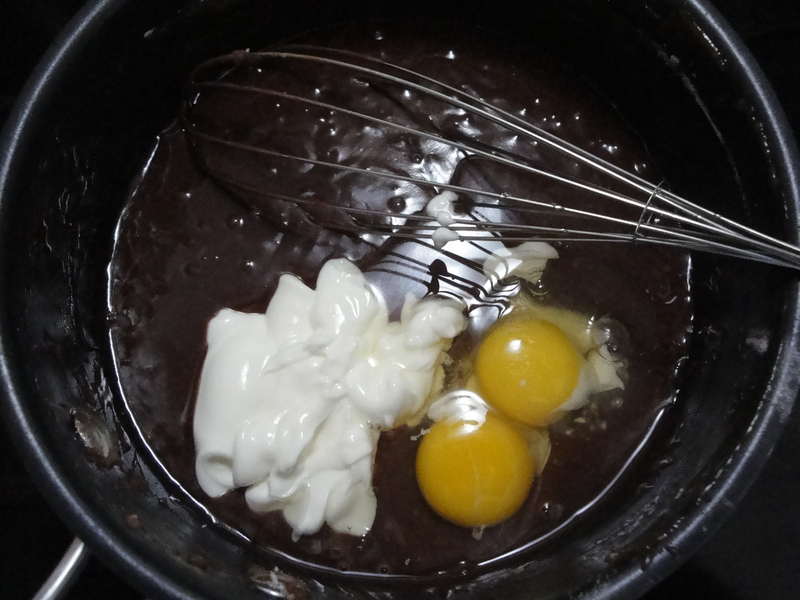 The batter is spread out onto a cookie sheet, baked thin, and covered with a velvety, sinful layer of more chocolate goodness. The frosting is the real star of this show. 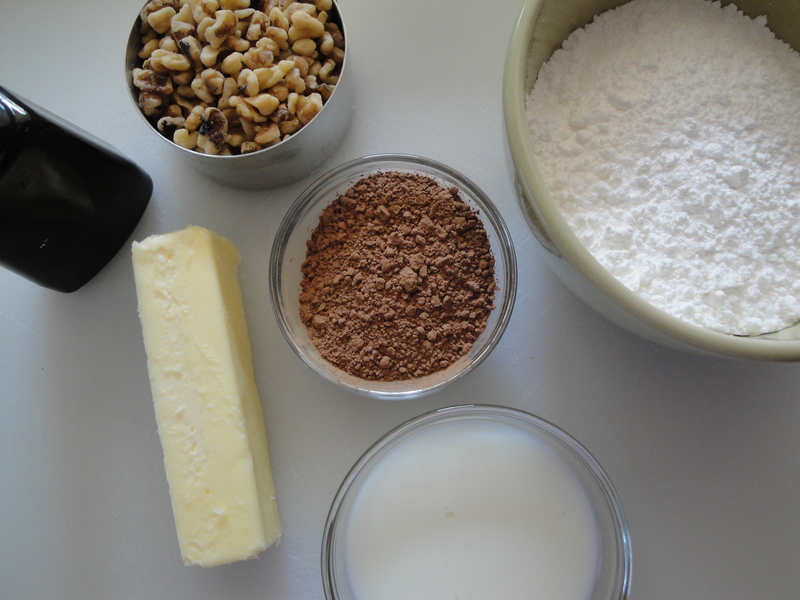 Butter, cocoa, and buttermilk are cooked together and then blended with powdered sugar, vanilla, and walnuts. 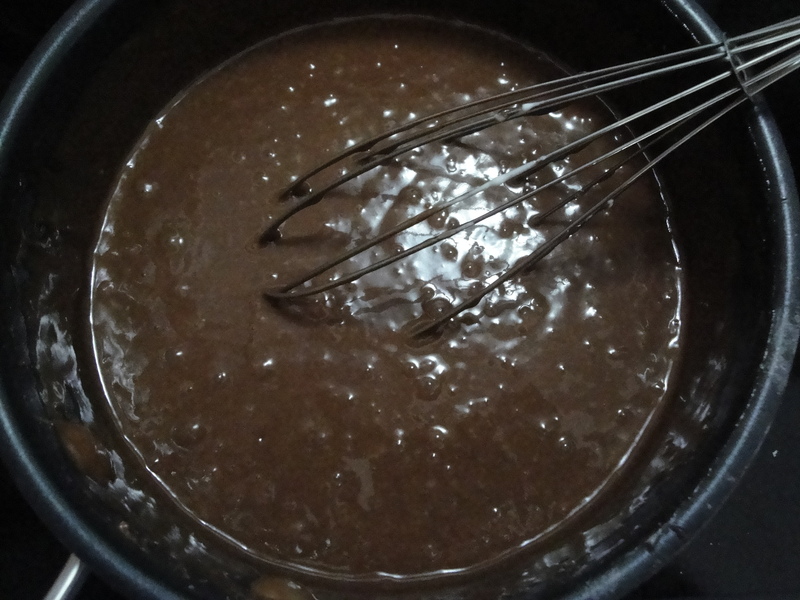 As it cools on the cake, it thickens while still staying creamy and decadent. 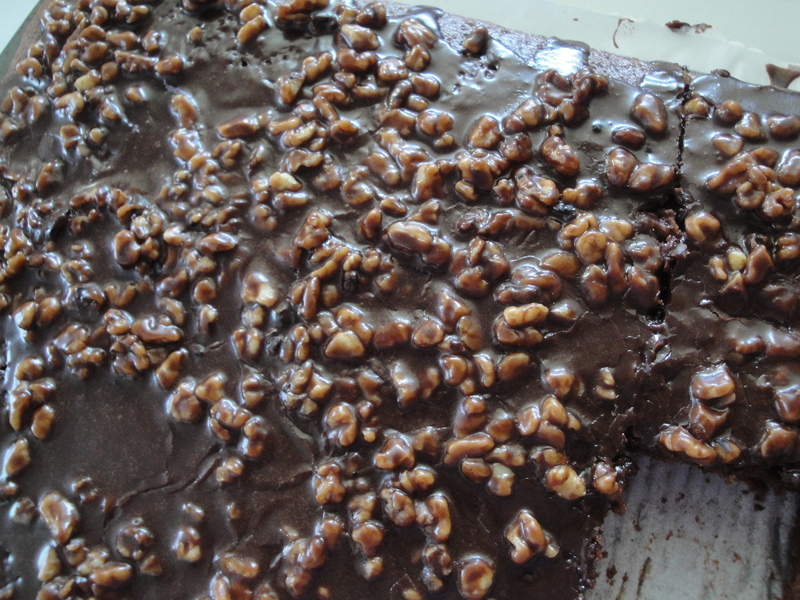 Texas Sheet Cake isn’t just a chocolate cake – it’s THE chocolate cake to make. Think of it like a lighter (in texture, not calories!) 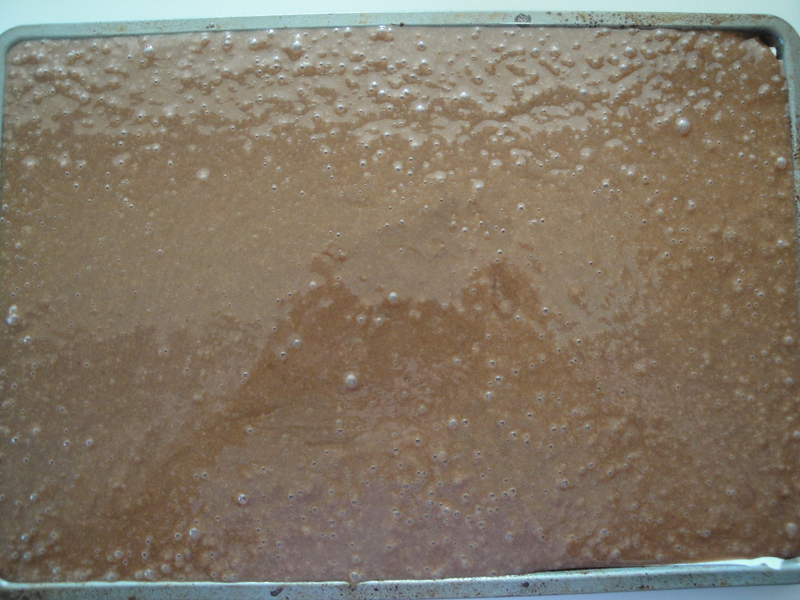 version of a frosted brownie. Whether you made it with your mom like I did or if you’ve never tried it before, please put it on your to-do list. 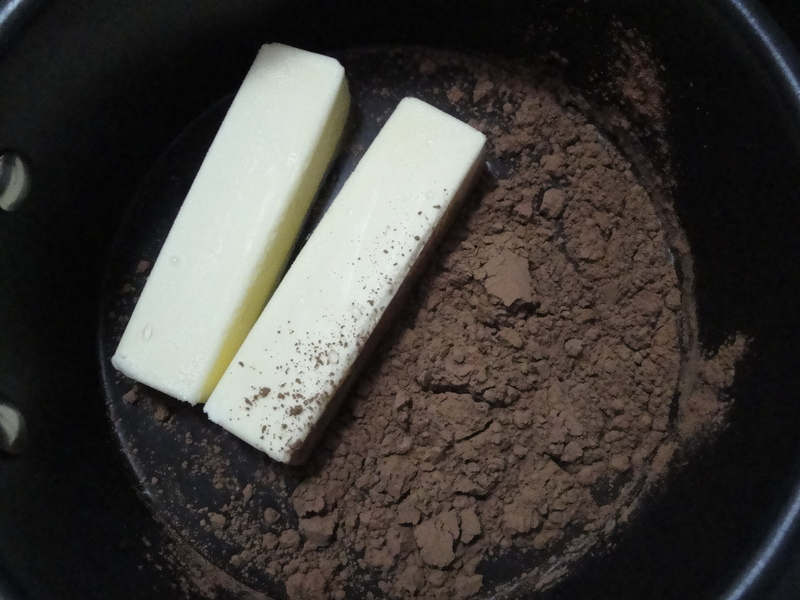 Bring butter, water, and cocoa to a boil in a saucepan. I’m pretty sure I used sour cream instead of buttermilk here now that I look at the pictures, but the cake turned out phenom anyway! 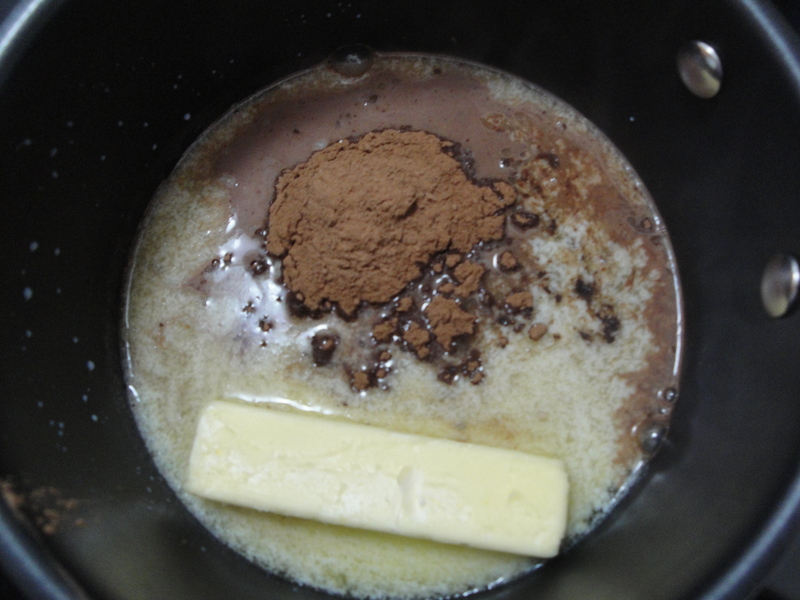 Add butter, cocoa, and buttermilk to a saucepan and bring to a boil. Stir in powdered sugar and vanilla. 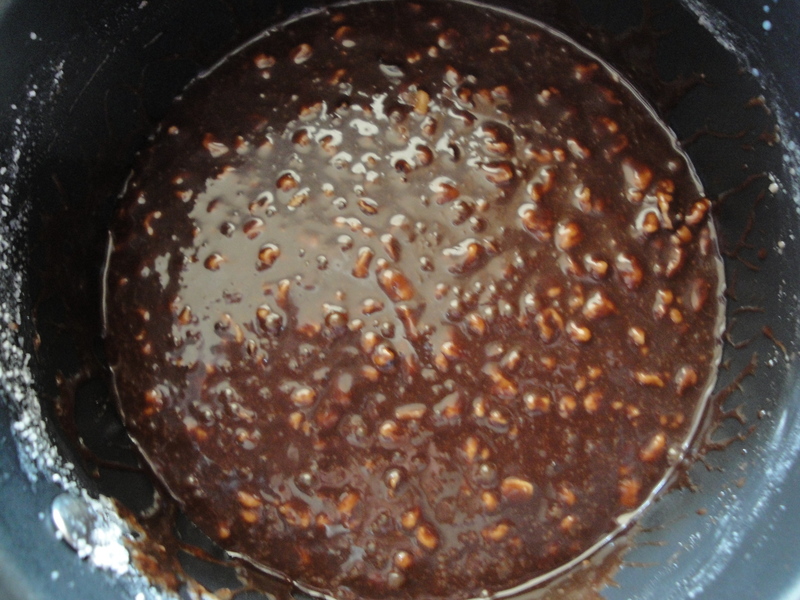 Add in walnuts. 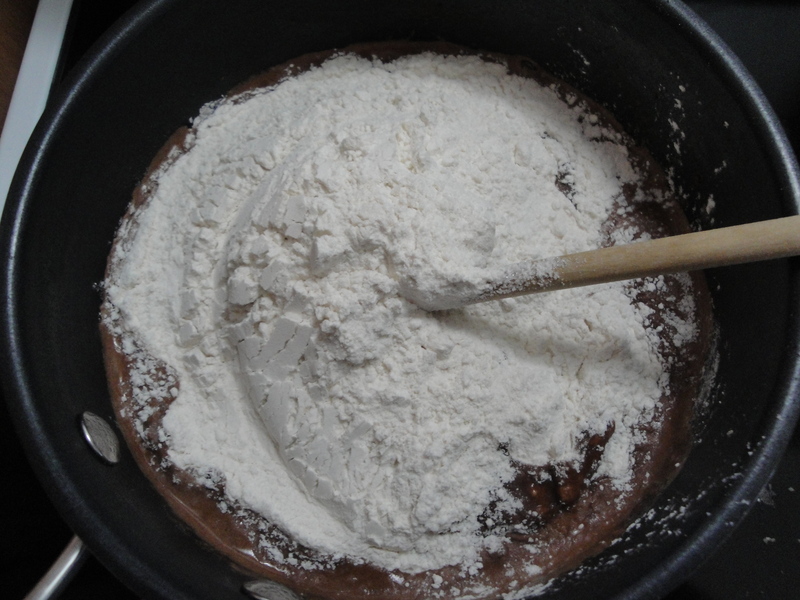 Carefully pour the cooked frosting over the cooled cake (again, make sure your pan is deep enough to contain the frosting!). Once the frosting has cooled, dig in! That looks amazing! I’d eat it in a second, but my boyfriend is allergic to walnuts and egg whites – do you think it would work well with almonds, instead? And, is there any chance it would work with egg yolks only – perhaps with the number of them increased? I am definitely going to try this! 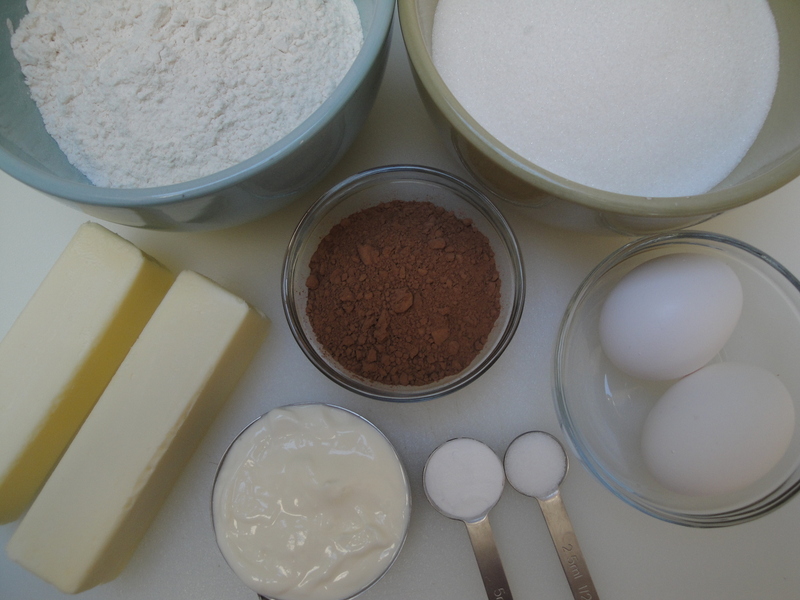 Will let you know how it goes – as I’m in Sweden, and buttermilk isn’t an option, I am considering making it with curd (kesella), which is like 10% fat cottage cheese taken through a fine sieve so it’s not very chunky. Or I can try sour milk… hmm, the options, the options! My mom made that when I was a kid, too – and it was ALWAYS a huge hit. You definitely want to make it to share at a gathering or something, or else you’re going to be downing a lot of cake yourself, because it’s irresistible! I agree! I took my cake to work because there was no way I could trust myself around that much chocolate!